You could spend hours polishing your LinkedIn profile. As someone who has stared at several LinkedIn profiles to give recommendations, I know the hole you can fall into when you’re looking for a new job and need to “spruce up” your LinkedIn page. Although you could take serious time to critically review, edit, and re-review each section of your profile, you probably shouldn’t. Your LinkedIn page is vital for landing a new role, with 87 percent of recruiters using LinkedIn to vet candidates, according to data from Jobvite. Luckily, it’s easy to optimize the elements recruiters are most likely to check first. If recruiters can’t find you, they’re not going to reach out to you. It’s as simple as that. There are two ways recruiters can find you: through searches on LinkedIn or Google, and through their connections. Let’s start with search engines, since they’re easier to master. First, think about the types of roles you want to pursue. Are you looking for something in a field you already work in? Are you just starting out in this field, or making a large career change? List out the companies and titles you’d like to pursue in a future job search. Next, take a look at people at your target companies who have the job titles you’d like, if you can. Can’t find anyone? Try a comparable company or a slightly tweaked job title. Here’s a tip: Pro Tip: Want to stalk—I mean look—at someone’s LinkedIn profile without letting them know you “viewed” their profile? Search them in LinkedIn’s native search, then copy-paste their LinkedIn profile URL to a new incognito window. After you’ve found some keywords in these profiles, make sure to add them to your tagline, summary, and skills (if they are skills you possess). Also, don’t forget to turn on the setting in LinkedIn that lets recruiters know you’re open to new opportunities! That way, recruiters will find you first when they’re looking for candidates. Once you’ve made yourself as discoverable as possible, it’s time to home in on the sections of your LinkedIn profile that matter. And that means getting back to basics. 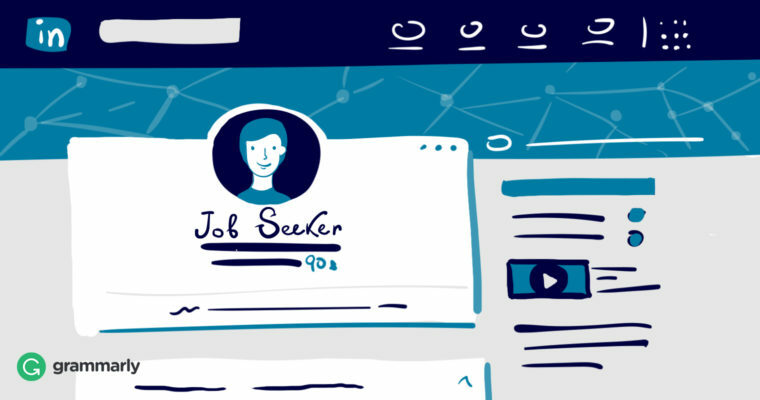 When I asked Angela Ritter, a recruiter at Grammarly, what she looks for in a perfect LinkedIn profile, she called out three major features: job titles, taglines, and summaries. Let’s look at each of these individually. Job Titles: Job titles are the easiest on this list, since recruiters are simply looking for honesty here. As much as “padding your resume” has become a cliché, lying about your title at past companies is a bad idea. Your potential employer will double-check, so stay honest! Tagline: You can either use your current job title or an aspirational description of the role you’d like, based on the keywords you found above. This helps with your searchability, so feel free to pad it with two or three keywords to make yourself more discoverable. Summary: These don’t need to be long, but they should describe what you’re trying to accomplish in your career, as well as what skills and experience you’re bringing to the table. Need help writing one? Check out my guide to summaries here. Now, let’s talk about connections. LinkedIn is designed to encourage the collection of connections from people in your address book, who went to your school, and even people you probably don’t know in real life. While you should connect with as many people as you know in real life, connecting with random professionals without a reason isn’t a good idea. At the end of the day, your connections represent people you (unconsciously) endorse, so try to connect only with professionals with whom you’ve shared some sort of experience. That said, connections and recommendations are important to recruiters! Just hear what Alyssa Seidman, another Grammarly recruiter, had to say when I asked her about the value of LinkedIn to recruiters. This isn’t the first time I’ve said this, but it bears repeating. The details of your LinkedIn profile are important! I have personally disqualified candidates because they had typos in their profiles, and pretty much every other hiring manager has done the same. Details matter!